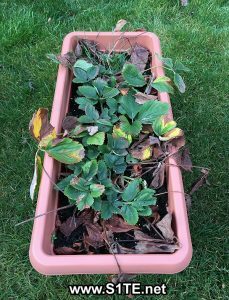 20th February onwards is an ideal time to start removing dead leaves, old stems and withered fruit from your strawberry plants. This is done to help encourage extra fruit this year from your strawberry plants. 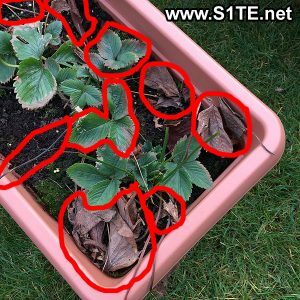 Be careful when pruning around the crown of the strawberries, this should never be touched as damaging this could kill the plant. You are safe to cut anything 2cm and further away from the crown, try not to trim or remove new leaves forming these should be bright green in colour. Here is a small graphic highlighting in red the parts that can be removed, it may seem drastic but it is healthy and good for the strawberry plants. 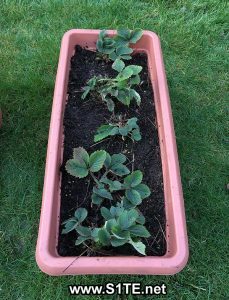 Here are some photos of the difference tidying strawberries can make. 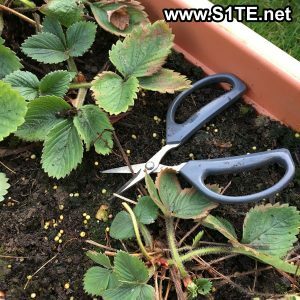 After I have trimmed and pruned strawberries, I give them a light feed of “Tomorite” which is high in nitrogen to help boost the plants after overwintering. 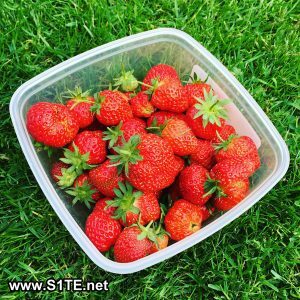 Growing Strawberries in Containers or Pots / How To Guide & Tips?